Do You Scout With a Purpose? Hunting a new piece of dirt can be overwhelming — whether private or public land. But if you’re like us here at Realtree.com, you relish in it. You welcome the challenge. And you appreciate the rewards all the more for it. If you plan to scout, and hunt, a new piece of ground from scratch, follow these 10 steps to get started down the right path. Begin by pilfering through every type of map you can get your hands on. Aerial maps. Topo maps. Hydro maps. Plat maps. If they make it, look at it. There’s something to be learned. Even small details have the potential to make big impacts. When scouting, look for likely edges (transition lines), food sources, water sources, bedding areas, variations in terrain, and any key geographical locations that have the potential to attract deer. You get the picture? These are breaks in habitat, or perhaps better defined as where two types of habitat meet. Transition lines can also be terrain-based. Such as, where a bluff rolls off down into a bottom, where a drainage ditch cuts through a section of flat ground, or even a saddle that cuts through a mountain or hillside. Post cameras as you scout through a property. Find hot sign? Slap a camera on it (strategically). I like to hang cameras high and angle them downward — especially on pressured ground. Deer oftentimes know what a trail camera is. Hanging them higher up where they aren’t in a deer’s direct line of sight will help conceal them. Personally, I like to hang cameras over hot scrapes, rub lines, water sources and trails that I feel are leading into well-used bedding areas. Finding actual beds — and marking them so you remember where they are — is crucial. This lets you know both the general and specific areas deer are laying down during daylight hours. Once you have this information, you know how close you can (and cannot) get to said bedding areas. Once you find the beds, read the primary trails and escape routes. Think about different wind directions, how easily you can slip in and out of the area without being seen, smelled or heard, and identify quality stand locations based on those factors. Hunting pressure is important to gauge. If it’s low, you can afford to start out hunting further from the beds. 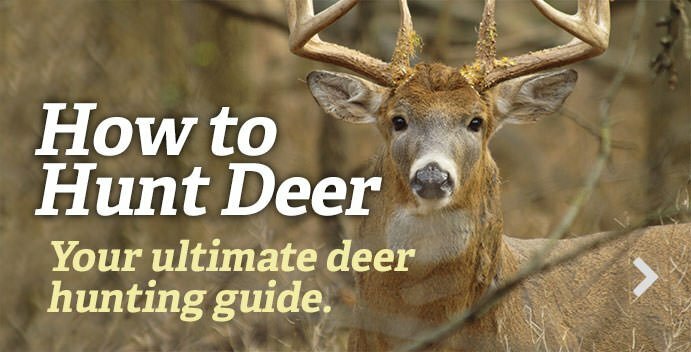 In these cases, deer are more likely to move further from their beds during daylight and you don’t have to risk pushing in further and potentially bump deer while going to the treestand. On the flip side, if hunting pressure is high, you probably will have to slink closer to those beds in order to see mature bucks during legal shooting hours. I try to gauge hunting pressure via several methods. First, drive the roads and parking lots to see if other hunters are around. Next, look for boot tracks while in the field. Lastly, check for stands, ground blinds and trash (sadly). And if you see people while out there, that’s probably a good sign the place is getting hammered. Plot all of your findings on either a physical map or an app. You won’t remember it all. Don’t kid yourself. Make notes. Then analyze the situation, brainstorm possible scenarios and think about how you’d execute each one. Replay it over in your mind so you have a firm game plan come time to hunt. If hunting a large property, or if you have several properties to work with, conduct a series of flash hunts. Grid off the area and hunt the high-odds spots first. Then hunt the lesser spots as time goes on. Be mobile. Eventually, you’ll have a pretty good feel for the place. If hunting a short window, or if you have a lot of ground to cover, you can’t afford to be passive and slow-moving. Be aggressive. But be responsibly aggressive. Take calculated risks that make sense. But don’t bull-rush into an area and blow it out. It takes thoughtfulness. Do everything with a purpose. And when it all comes together, when it clicks in your mind and you figure a property out, that’s the reward. That’s the goal. Thats when it's time to whack and stack.